I know this has to be ridiculously simple but how do I edit the text in this file? To edit the text in this Flash Card Swipe Interaction, select the rectangle you want to edit, then click States. Click on the Normal state, then click Edit. From there you should be able to edit the text. Thank you! I knew it had to be really simple! You're welcome, Connie! Happy Holidays to you as well! I am also wanting to make the card set smaller and duplicate it so that I have 4 sets on one page. Is it possible to group it, make smaller and copy/paste the entire set of cards? Seems the check answer box is not grouped with the text. I'm seeing that as well. 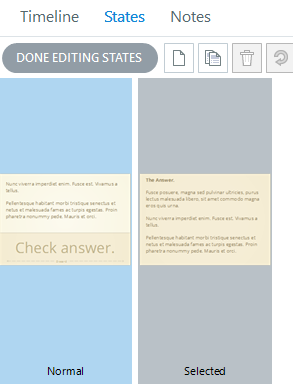 The 'Check Answer' box was added in through Edit States, so it can't be grouped with other slide objects. If you've got four categories of cards, you may consider instead adding a menu slide with 4 buttons (1 for each category). Each button will lead to a card swipe slide (so you would have a total of 4 card swipe slides), and after all cards have been swiped, a button will appear that will lead the user back to the menu slide. Would that work for your design?